Deductive Seasoning: I got a Libre! Diabetic geeks have been following the progression of the technology of continuous glucose monitoring systems (CGMS) for some time. They have been commercially available for some time, but prohibitively expensive and rarely covered by insurance. A CGMS allows you to insert a very shallow needle that just stays there and provides glucose readings. These are not blood glucose (bG) readings like we get from standard bG meters, but readings of the glucose in interstitial fluid, the liquid between cells. 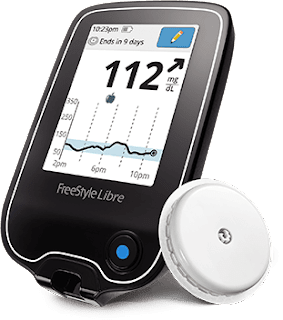 That's why I was so excited to see Jenny, author of Blood Sugar 101: What They Don't Tell You About Diabetes, post that she had gotten a Freestyle Libre to play with back in November, before they were even on the market. I've been following along excitedly with her experience since. I'm a T2 and a geek; I wanted one! Image credit: Freestyle Libre system © 2018 Abbott Laboratories. All rights reserved. The Libre system consists of a little sensor that goes in your arm and stays there for 10 days and a reader you wave at it to take a reading. I had looked up cost online and it appeared that the reader cost around $100 and each 10-day sensor around $50. 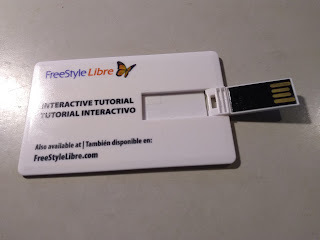 My insurance already has a relationship with Freestyle; the Freestyle Lite is the bG meter I've been using for several years. My endo prescribes 4 bG strips per day, so 120 strips per month as that's the maximum my insurance pays for. 50 strips cost around $30 on Amazon, so that'd be about $72/month; three sensors would be about $150, so about double the cost of strips. Obviously, the insurance company doesn't pay these prices, but it gives a feel for the difference in cost. With the strips, I can test 4 times a day, assuming I don't screw up and waste a strip. Given that you need at least 8-10 readings to get much of a picture of what is happening, I tend to not test for days and even weeks at a time, to save strips to do more comprehensive testing. 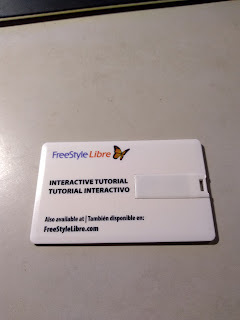 With the Libre system, I could potentially test scores of times each day, as much as I wanted. Furthermore, it is just so easy to test, since you just point the reader at the sensor, that you are inclined to do it repeatedly. This in comparison to getting out a strip and inserting it in the meter, poking your finger with a lancet, squeezing the drop out on to the strip, waiting for the meter to read - and having all the paraphanelia to do that with you at the time. With the Libre, the sensor is in your arm, so all you need is the reader; you point it and it beeps to tell you it took a reading. You can test on the john in the morning, before you drive, when you're out and didn't bring your meter kit with you, when you're in bed at night. You can just test like a maniac! I expect Abbott to negotiate hard with insurance providers. 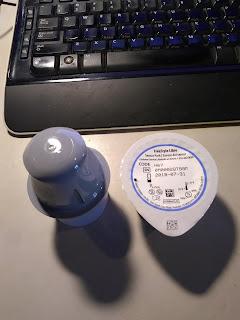 When my insurance first switched me to the Freestyle Lite, they gave me a coupon for a free meter, presumably Abbott swallowed the cost on that. I expect they'll do something similar with the Libre eventually, and make it available to Ti diabetics and insulin-using T2 diabetics. But I think they're useful for *any* diabetic, on insulin or not, to get a more full picture of how various meals effect your bG. I expect my insurance will be covering Libre sensors soon, but I couldn't wait. While you do need a prescription, you don't need insurance if you're willing to spring for it yourself. 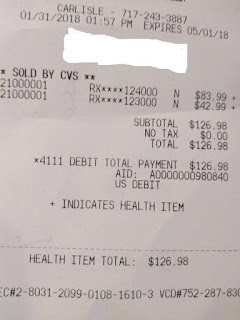 I first checked with the pharmacy at my local grocery, where I get most of my prescriptions. The pharmacist told me they didn't have them in, but could get them. At my next appointment with my endocrinologist, I asked for a prescription and she looked it up on her little computer screen and told me my insurance wouldn't cover it. I told her I knew that, but wanted it anyway. She wrote the script and it was transmitted to the pharmacy. It is a bit over an hour drive to get back from her office, and by the time I was home, the phone was ringing - the office calling to tell me my pharmacy said they couldn't fill the script. They had a suggestion for another local pharmacy, so I said OK. I then called the other pharmacy and they also told me it wasn't covered by insurance, and I told them I wanted it anyway and they said they'd get it. Then I went to the grocery and stopped by the pharmacy that had refused the prescription and asked them why since they'd previously said they could get it. They said they did have the prescription, they had only told the doctor's office my insurance wouldn't cover it. When told I'd pay, they said they'd order it. I generally run all my errands once a week, so I went home to wait, confident I'd have a Libre in a few days. I then called my grocery pharmacy a few days before I expected to go in to verify they'd got the Libre in. They hadn't! They said their distributor couldn't get it, but they had a new distributor starting in a few days. Luckily, I had the second pharmacy as backup. I went and they had it in! I excitedly handed over way more cash than I wanted to. I came home with two boxes, bright yellow to let you know they were Freestyle products. 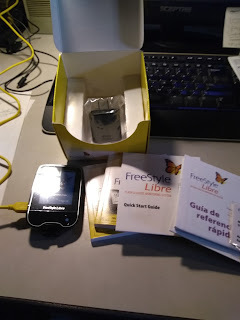 In the first box, we had the reader itself, an inexplicably yellow USB cord, a USB charger, and a bunch of little books. 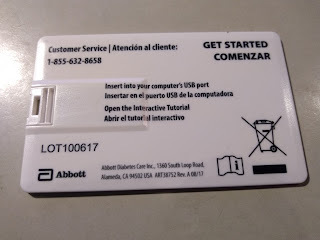 If you turned the perplexing thing over, it claimed it could be inserted in your computer's USB drive. I didn't see how! Jeez, another new technology to make me feel old. I asked a 19-year-old had she ever seen anything like this, assuming she'd just recognize it and show me how stupid I was being. Nope! She didn't figure it out either. Eventually, my husband came home and figured it out. Turns out, it does fit in a USB drive. And it runs on a Windows 10 PC just fine. I've no idea about Apple or Linux or such though. The contents of the tutorial are the same as one of the little printed books they gave you, so whether it ran or not wasn't really critical. The only addition was that it had videos on various pages to demonstrate things. However, it occured to me that I wanted videos to explain things. If I screw up a strip when testing with a bG meter, I wind up wasting 50 cents, whereas with this doohickey, I'd be out 50 bucks! I watched all the videos! And then put everything aside so I could actually insert the thing when I had someone around to photograph the process. The second box contained the sensor, which consists of the sensor applicator and the sensor pack. Next post: inserting the sensor!